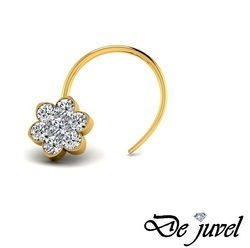 De Juvel offer a comprehensive collection of Gold studded Latest Nose Pins Collection that are a significant sign of indian traditions and culture. These nose pin are turned out from highly pure gold. We offer these gold studded nose pins in various shapes, sizes and designs to our widespread clientele. Owing to our rich experience of this domain, we have been able to offer high quality Single Stone Gold Nose Pin to our valuable customers. 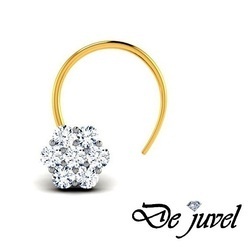 Our firm is specializes in providing our prestigious clients with an impeccable array of Diamond Studded Gold Nose Pins. Available in a spectrum of sizes, shapes and designs, these nose pins is highly admired for their attractive designs. With excellent expertise, we manufacture and supply a vast assortment of Classic Gold Nose Pins that are made with pure gold. The numerous design of our products is highly appreciated by our clients. Color and clarity is always considered the important factors by our craftsmen while fabricating these Pins. 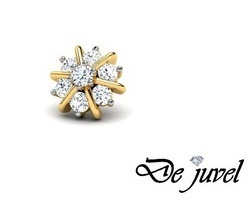 We offer a vast assortment of designer Gold Nose Pin that are made with pure gold. Available in a spectrum of sizes, shapes and designs, these nose pins are highly admired for their attractive designs. Our nose pins provided as a perfect combination of Indian traditions and culture and we offer them in an economic manner. These are suitable for the women and girls of all age group. Supported by skilled personnel of jewelry domain, we bring forth a wide collection of 18K Designer Gold Nose Pin to our women buyers. Creative experts at our manufacturing unit design these nose pins. Professionals at units employ optimum quality precious stones and other metals, which is acquired from consistent providers for offering quality certified jewelries. Furthermore, we offer these nose pins at lower cost. 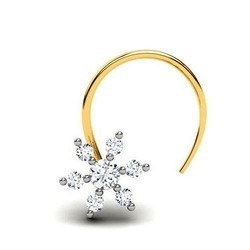 We offer Gold Bride Nose Pin in different designs, finishes and sizes to match the taste of diverse customers. We present an exclusive range of Gold Nose Pin, which is designed from pure gold to enhance the beauty of the women. 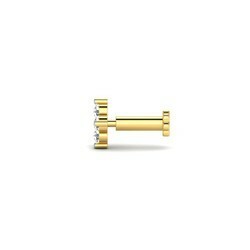 Our Gold Nose Pins are available in varied designs, stone work, and sizes to meet the requirements of the clients. 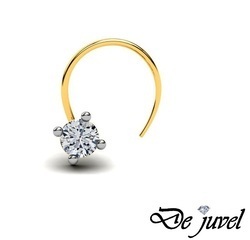 Backed by the team of highly qualified professionals, we offer Gold And Diamond Nose Pin to our prestigious customers.